At an ice factory in Shanghai, a worker pulls 250-kilograms of ice from an ice box using robotic arms. The ice falls to the floor, and tiny frozen shards fly through the air. 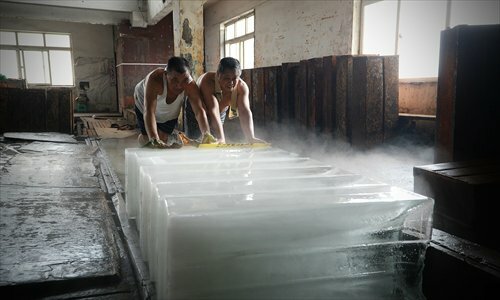 The factory's more than 20 workers have been working shifts to make ice day and night. Demand for ice is much higher during the summer. Most of the ice goes to supermarkets to keep vegetables and fruits fresh. Hospitals and textile factories also need to use lots of ice. The workers start by filling the ice boxes with water and lowering the boxes into a large pool. Then salt and liquid nitrogen are added to cool the pool down and freeze the water. The process takes about 30 hours. Then the workers dump out the ice onto the floor using machinery, put the blocks on hooks and manually drag them onto two rails, which transport the oversized ice cubes into an elevator and eventually into cargo containers on tracks, to be delivered all over the city. Every piece of ice needs to be processed in less than 20 minutes, otherwise it will melt and stick to the floor. 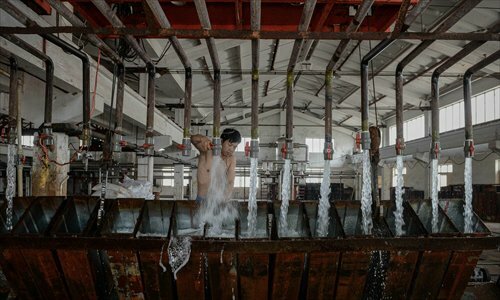 The temperature around the pools is -10 C, but in the factory, it can be as hot as 38 C.
Yao, a 59-year-old worker, said the temperature is a big challenge in the job. When the ice is first made, the factory becomes so cold that he shivers. But after pushing the ice for a while, he'll become soaked with sweat. Every day he spends four hours in this extreme temperature shift. Besides the temperature, workers often get bruises on their legs from scraping against the ice. 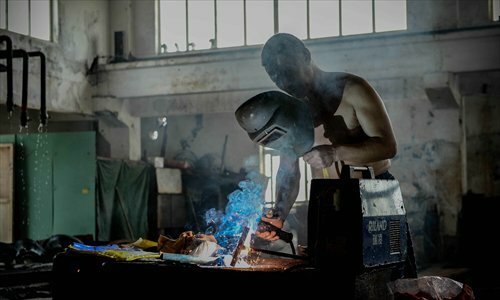 Arthritis is also a common problem among the workers, and they have developed their own ways of protecting themselves. One worker said he won't go into the ice workshop if he's sweaty, and always wears winter coats when he goes into the ice storage room. Also, he combats the cold by eating hot peppers and sipping alcohol. "Young people don't like to do this kind of manual work nowadays, but we are used to this kind of job." Yao said. "Besides, the more ice we make, the more contribution we can make to the city."